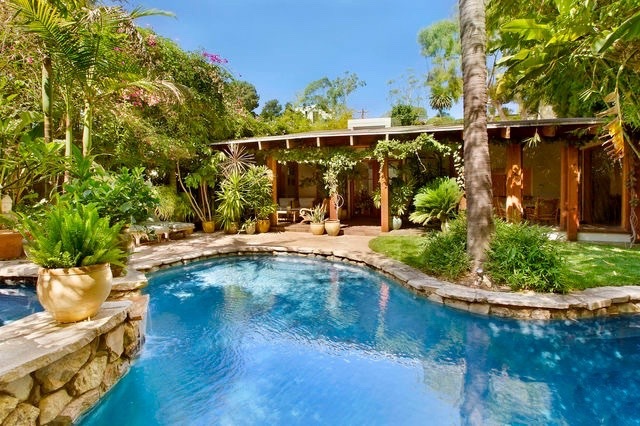 Mid-Century single story modern home on coveted Amalfi Drive in Santa Monica Canyon. This tastefully renovated 3 bedroom, 3 bath home offers a dramatic open floor plan, chef's kitchen with breakfast area, large den with bathroom that could be used as a fourth bedroom, and a relaxing master suite with Zen garden. Other features include beautifully finished wood floors, skylights, top of the line appliances, and sliding glass doors. The great room with fireplace opens onto a covered porch surrounded by the lushly landscaped garden with pool and spa. This unique and special home is a rare offering and is ideally located near Rustic Canyon Park, Canyon Elementary, local shops and restaurants, and the beach. Enjoy your own private retreat minutes away from the hustle and bustle of city life and just a stone's throw from the beautiful Pacific Ocean. Berkshire Hathaway.